Huge Savings Item! Free Shipping Included! Save 13% on the EZVIZ Mini 360 Plus 1080p HD Pan/Tilt/Zoom Home Security Camera - WiFi Surveillance System, Works with Alexa, Motion Tracking, Night Vision, Image Touch Navigation by EZVIZ at Mamboe. MPN: EZMIN360PLS. Hurry! Limited time offer. Offer valid only while supplies last. The Mini 360 Plus’s panoramic 360° touch navigation makes controlling what you see easier, viewing any point around your room with just a touch. The Mini 360 Plus’s panoramic 360° touch navigation makes controlling what you see easier, viewing any point around your room with just a touch. "Alexa Show me the Living Room"
Enjoy HD 1080p resolution, 360 degree coverage, pan and tilt control with digital zoom, a wide-angle 92° lens, and smart motion tracking. With Pan and Tilt control, you have greater flexibility to place the Mini 360 Plus, including a flexible install kit for indoor mounting. It also looks great on any table or book shelf. Adding as many cameras as you want is easy and visible all in one app, for your home or small business. The Mini 360 Plus runs on EZVIZ's adaptable platform, which adds new features and functionality as they become available with easy one-click updates. PANORAMIC 360° TOUCH VIEW NAVIGATION - Capture the entire room with responsive one-touch pan and tilt controls and digital zoom. The Unique panoramic touch navigation takes a 360° picture of the room, and allows you to view live video at the angle you want by a simple tap. SMART MOTION TRACKING AND NIGHT VISION - Track and record any moving objects seen in the room with smart motion sensor. 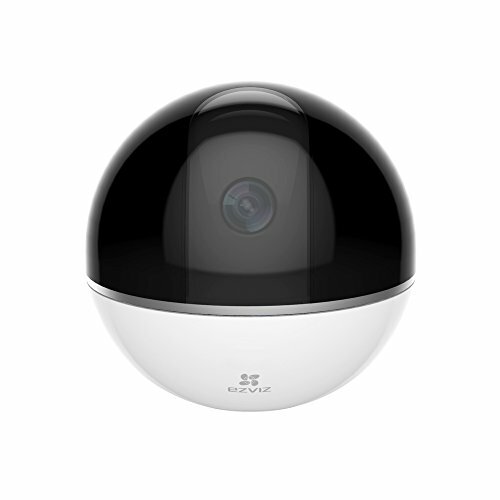 Mini 360 Plus offers up to 33 feet of clear night vision, HD 1080p resolution, and a 92° wide angle lens which makes objects being tracked easily visible, even at night. FREE CLOUD AND LOCAL STORAGE - Access your video content and history anytime. Highly suggest to use 128 GB (131,072MB) microSD card if you are looking to store one month of motion detection recording. EZVIZ also offers a free (optional) 30 day trial to their CloudPlay service, which includes a 7-day cloud recording and 2-minute daily recap. If you have any questions about this product by EZVIZ, contact us by completing and submitting the form below. If you are looking for a specif part number, please include it with your message.